It’s been about eight months since I stopped writing. It wasn’t by choice. Unresolved trauma kept me from continuing my project, and I fell into a months long depression trying to run from it. Then I got mad. I know who I am. I know what is in me. I know what I can do. So I went through eight weeks of prolonged exposure therapy to treat the ptsd that’s kept me stuck in a loop for the past three years, and the c-ptsd that’s affected me my whole life. And it helped. And I am writing again. I can’t begin to explain how good it feels. ​I’m relearning how to care for myself, manage my life, explore my creativity, feel joy and gratitude and deliberate courage and gentle strength. I am learning to live in the present, to see the past as nothing more than fodder for my work. But frankly, my body is not cooperating. I’m nine days into an arthritis flare and after all of my progress I am stuck on the couch consumed by pain with an apartment as chaotic as my mind and zero spoons to spare. And now I know that physical pain can take away much of my hard-earned peace. And I know that my disease is chronic and incurable and progressive. And I don’t feel so strong or brave anymore. But here I am using words to share a bit of my soul with the world. So that’s something. My thoughts are still pretty jumbled from pain and lack of sleep (aka painsomnia), but this is inside me and needs to come out. 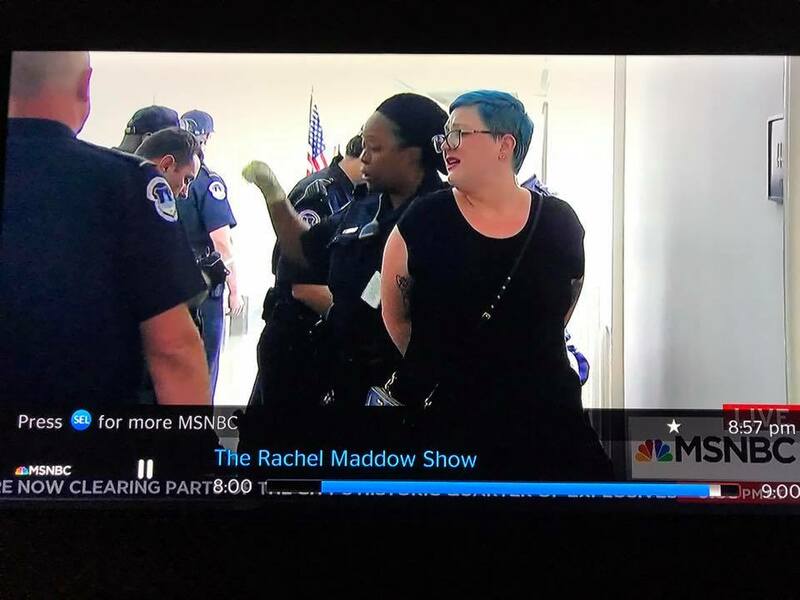 I was arrested yesterday, and spent the day with the United States Capital Police and nearly 100 other activists who put their bodies on the line to demand that our representatives stop the health care bill that will harm millions to give tax cuts to the wealthiest among us. To be clear, I don't know exactly how many of us were arrested. The statement released by the USCP said 80 protesters were arrested in 13 different locations throughout the Senate and Congressional Offices. But while in custody, I caught a glimpse of the handwritten notes detailing the full protest that officers were using for reference while processing us, and it read "Total Arrests: 93." I do not know if everyone is out yet. So why was I there? Because I can do no less. I am 29 years old and I live with 3 autoimmune diseases. My normal is not easily understood by most, even people I consider friends. My twenties have been spent in doctors offices and hospitals and waiting at pharmacies. Sometimes for my own care, often for my husband's. He is an insulin dependent diabetic, and in 2015 when he was dying, I gave him my left kidney. He is alive because the Affordable Care Act allowed us to purchase insurance despite our pre-existing conditions. He is alive because of the ACA, the Tampa General Hospital Transplant Center, and my left kidney. Before the ACA, we went bankrupt and lost our home in Pennsylvania, while spending every dollar we had saving his vision from diabetic retinopathy. The ACA allowed us to build our lives back up, to afford insurance that keeps us from going broke at any moment. During the years my husband was sickest, I cared for him. And that whole time, my very own father argued with me ceaselessly and shamelessly ranted his Fox News inspired hatred of the bill at me. He protested the ACA and urged the Tea Party candidates he supported to repeal the bill. All the while, he knew that it would devastate his own daughter, as well as the nameless faceless masses of Americans who rely on the bill for it's protections of those with pre-existing conditions and Medicaid expansion. There are many reasons I ended my relationship with my parents two years ago. That is one of the most painful ones. I look at the faces of people who do not care about the lives of others, and I feel shame, because I come from those people. And then I use the tools I've learned to squash that needless shame, and use it to fuel my persistence. I fight back against the evil they bring. We cannot choose who we are born to. But we can choose with whom to share our time, affection, attention, respect. We can choose to use our bodies for good, and stand up for those who are being harmed. ​And yes, people are already being harmed. This fight is a struggle. It takes so much energy and focus to spend the day in police custody, hands cuffed, when you are ill or in pain. It is an emotional drain to be worried about the very real possibility of losing care when you have a medical condition. Stress makes chronic illness worse. They make us sicker just by their attempt. But they also make us stronger, more resilient, more ready to do what is necessary. I have so much love and gratitude for the team of Floridians (and 2 NYers supporting!) who got arrested outside Congressman Curbelo's office yesterday, for all those who were there to support us, to the 15 other teams targeting other locations, and to Housing Works for organizing the day. Please keep calling your senators, spreading the word, sharing the stories you hear. We will #killthebill together, but we cannot quit. I'm about to inject myself with my new medication, another TNF inhibitor, hopefully one that will work more than the last version I tried. A TNF inhibitor is a form of immune suppression used to treat a few severe autoimmune diseases. I am taking it in the hopes that it will calm the inflammatory arthritis that has been ravaging my twenty-nine year old hips, shoulders, ankles, and spine, so that I feel, in every way, much older than I am. Chronic pain does that. It makes every day drag on as if it were weeks, while at the same time placing you in a fog so dense that when you finally find a moment of clarity, you wonder where the time went. I am at once ancient and ageless. At the moment, I'm telling myself I am waiting for the pre-filled syringes to come to room temperature, as the instructions directed, but really I am avoiding it. I'm avoiding the pinch and sting, and the lasting burn that I know will come after. I'm avoiding the wave of nausea I can already feel waiting to ride over me; I have never been comfortable with needles. I make rules for myself. I will do the two injections, one after the other, as soon as I am done typing out my thoughts. I will reward myself afterwards with a break from my ever growing to do list. No, I won't. There is folded laundry covering the bed, and more in the dryer waiting for me. I berate myself for my anxiety after reading the medication information booklet. The side effects are no joke, and as much as I hate to admit it, I am my mother's daughter, and she is a world class worrier who some may describe as a "hypochondriac." I tell myself over and over that I won't get cancer, or a life threatening rash, or go into heart failure (at least not from this, right now). I tell myself to snap out of it and step up. I think of my husband, an insulin dependent diabetic who injects himself several times per day. I think of the quiet courage and strength that takes. I tell myself I am strong, stronger that I feel most times. I remind myself I have been through so much worse and so much more than this small series of injections. On Monday, in my work as an activist, I spoke at a die in to protest the new health care bill. My family relies on our coverage that we purchase through the ACA exchange. Our coverage is far from perfect but it provides myself and my husband (who is a kidney transplant recipient, and I his donor) with the necessary treatments we need to live. And I am weeping because there are people in power right now who want to take even this from us. Now I will inject the medication that costs me, even with our "platinum" plan, just slightly more per month than my parents spent on their mortgage for the home I grew up in. And I am so very privileged to be able to afford it at all. Without my insurance, the list price is over six times as much. There is no chance I could continue it. In a few moments I will stop writing and go through the ritual of cleansing my skin and giving myself medicine that is really poison, but apparently that is what my body needs. And every second of the discomfort of the injection will be compounded by the shame I feel to be a burden on my family to have to pay for this medication at all, and the fear I feel over what will happen if the Affordable Care Act is actually replaced. The cynic in me says I shouldn't bother starting the medication, as the potential of finally finding a treatment that works only to have to stop it or lose everything else is more than I can bear. But bear it I will, if I must. I won't stop fighting for my care, even when it feels hopeless. I won't stop fighting for my quality of life, and for my husband's right to the medication that keeps him alive, and for everyone else who is terrified right now.